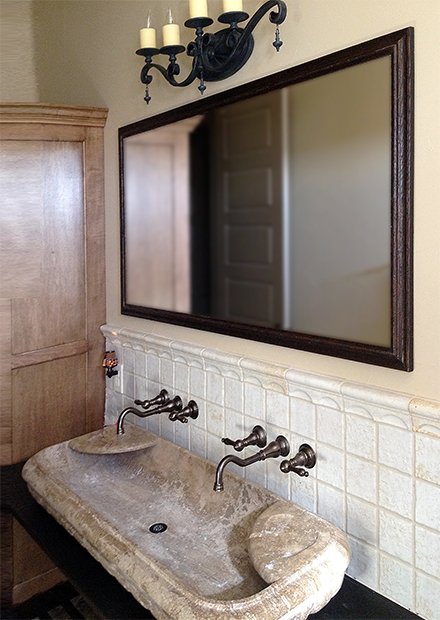 We at Texas Custom mirrors are designing and building mirrors all over Texas and the United States. 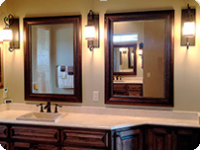 One of our specialties is bathroom mirrors and we produce some of the most beautiful bathroom mirrors anywhere. 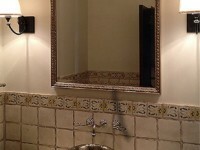 The mirror you see in the photo is for a client in Austin, Texas. They needed a natural wood oak framed mirror and we found one that perfectly matched their decor. This framed mirror was 72″ inches long and 40″ inches high. We built it with beveled mirror glass to give an elegant effect. We installed the mirror about 3 inches above the splash and 3 inches below the light. When we measure our bathroom mirrors we try to place them perfectly to look the best on the space you have. We offer very inexpensive delivery and installation in Austin, Texas. We offer installation to all Metro Texas Cities! However, we ship out framed mirrors nationwide.